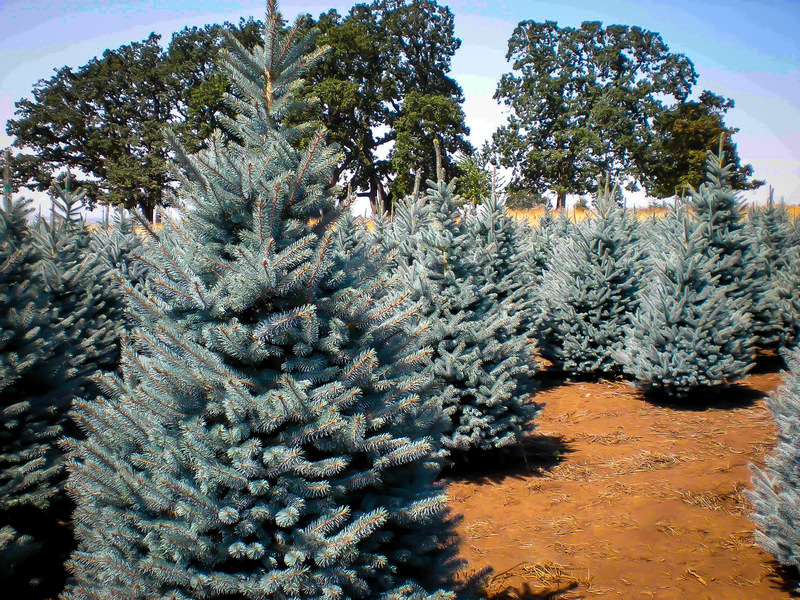 Baker’s Blue Colorado Spruce is the perfect small version of the extremely popular Blue Spruce. 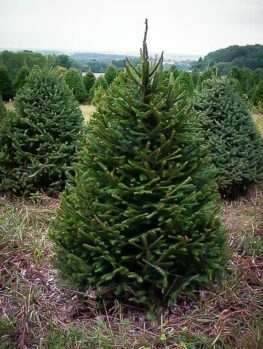 Instead of becoming a large tree, it stays compact, reach no more than 10 feet tall in 10 years, and staying about 4 feet wide at the base. It has longer needles, and a super-intense dark blue color, exactly what is needed for maximum impact. Grow it as a specimen tree on the lawn in a smaller garden, or in a group on a larger lawn. Plant it among shrubs for accent and year-round color, or as a lower screen. It also looks great in planter boxes and large containers, on the driveway or terrace. 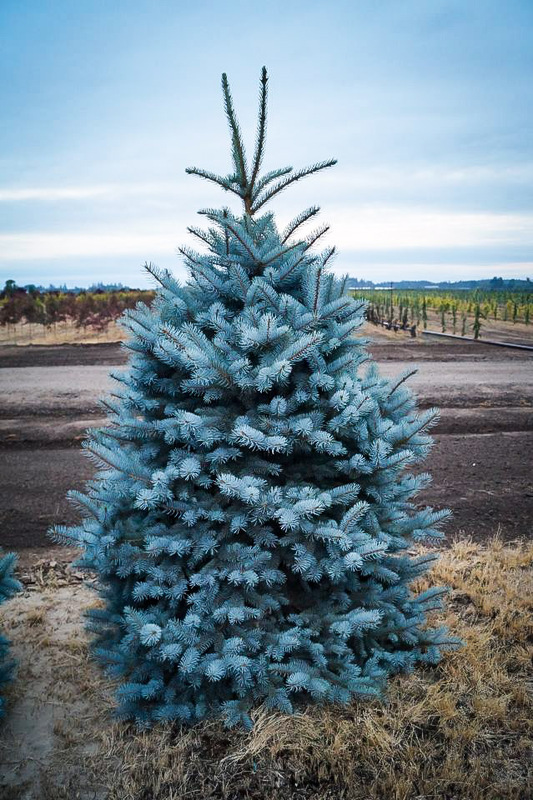 Baker’s Blue Colorado Spruce is very cold hardy, right into zone 3, and it thrives in all the cooler parts of the country. Grow it in full sun for the best color, although it will tolerate a little light shade too. It grows easily in almost any soil, from sand to clay, and including alkaline soils, just so long as they are well-drained, without standing water. 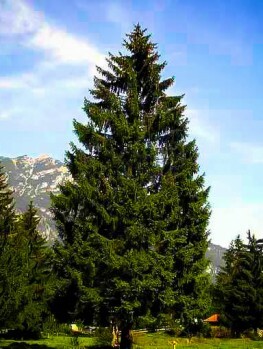 It rarely suffers from any pests or diseases, and it needs no trimming to keep its great shape, although it can also be trimmed into a perfect geometrical cone, if required. Beautiful specimens are essential in the garden, or it all too easily becomes a boring jumble of green leaves and round bushes. 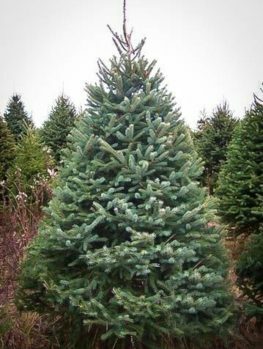 In colder areas conifer evergreens are the most reliable choices, and in most other areas too they offer dramatic forms and foliage colors that nothing else can deliver so well. The problem is that many of these trees in their natural type become very large – over 100 feet tall in many cases. We have all seen the house dwarfed and crowded by the ‘cute little tree’ planted 20 or 30 years earlier right outside the front door. It has now reached 60 feet tall, with serious consequences. 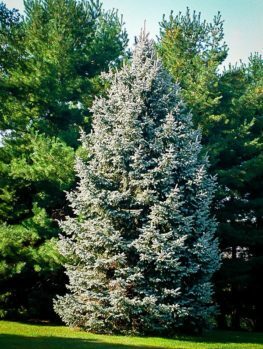 If you don’t have a lot of room, then it makes perfect sense to choose carefully, and look for a smaller form of these trees, with all the beauty – indeed, often with more – and less of the height and bulk. We have exactly what you are looking for. 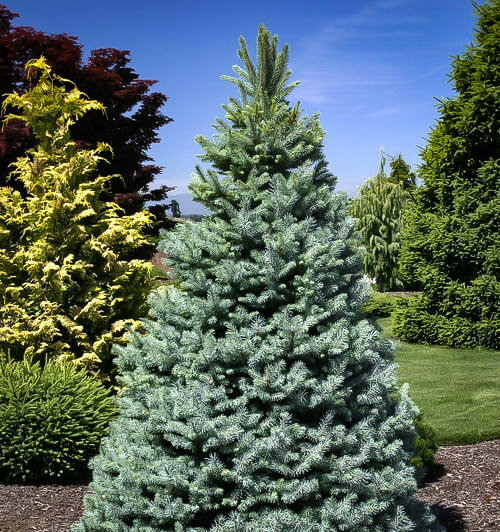 Baker’s Blue Colorado Spruce is a small form of a widely-planted and hardy spruce tree, that forms the same upright, pyramidal tree, but that grows densely and small, so that in ten years it will be less than 10 feet tall, and about 4 feet wide. Not only does it make a beautiful specimen tree for a smaller garden, but it is significantly more attractive than the natural tree. The needles are longer, and a dark, intense blue, making a more dramatic and powerful color accent. The branches are more tightly packed around the stem, so the tree is dense and beautiful. No trimming is needed to keep that terrific, dense pyramid form looking neat and even, and really, there is nothing to do but stand back and admire it. 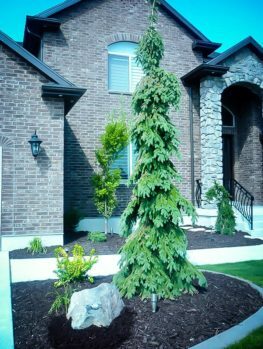 Use Baker’s Blue Colorado Spruce as a specimen on a smaller lawn, or as part of the foundation planting around your home. It will fit perfectly between two windows. Plant a group of 3 or 5 on a larger lawn, close enough together to make an attractive unit. Place one or more among the plants in the background of your beds, or among shrubs for contrast, vertical accent and year-round color. Plant them in large planter boxes, where they will live for many years with just a little care. Create an attractive lower screen, by planting a row, spacing them 3 feet apart. 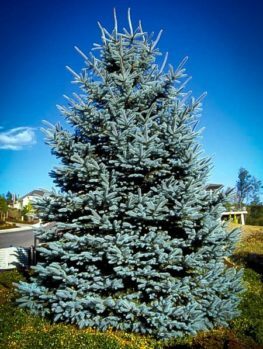 Baker’s Blue Colorado Spruce is easy to grow. It is incredibly hardy, thriving even in zone 3, with minimum temperatures down to minus 50. 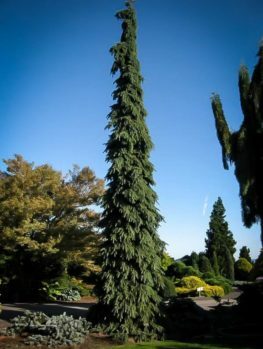 Yet it will grow too in all warmer zones, right into zone 8, although there it may begin to feel the heat, and you have other options, such as the different cedar trees, which also make beautiful specimen evergreens. But for all the cooler zones, it is always a top choice. It is also easy to grow, thriving in any kind of soil, from sand to clay, just so long as it is well-drained. If you do have wetter spots, plant it on a raised mound of earth, 6 to 12 inches above the surrounding ground, and at least 3 feet across. Make sure the surface of the pot is not buried, and even leave it an inch or so of the root-ball above the soil level. Water regularly in the first season, but then this tree has good drought tolerance, and it needs no significant care. Pests and diseases are uncommon, so sit back and relax. If you do want to keep an even neater profile than the natural one, trim back new shoots as soon as the needles are fully expanded. This will encourage multiple buds, and a denser profile. When removing any older branches, always cut back to a live branch, or right to a main stem or trunk, because bare twigs will not re-sprout, even if the bark is alive. 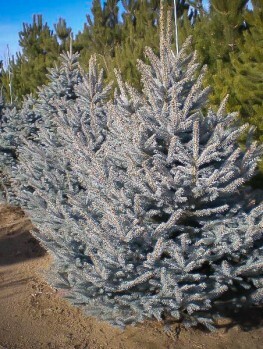 Baker’ Blue Colorado Spruce is a selected form of the of Colorado spruce (Picea pungens). We find this tree growing in the Rocky Mountains and all high places in the west, from Montana to Arizona. Growing on high mountains means this tree is super-tough, and cold resistant, which is why it is so popular in colder states. The variety we call ‘Bakeri’ was found among a batch of seedling trees, back near the end of the 1920s, somewhere in Massachusetts. In 1933, R. Ellery Baker, who was the manager of Hiti Nurseries, in Pomfret, Connecticut, introduced it for sale, so it is named after him. This is not an untested novelty plant, but a reliable variety that has stood the test of time, and its value has been proven in many environments. Our plants are formed by attaching stems of the correct variety to sturdy roots of seedling spruce trees to form a vigorous and healthy plant that is true to its name. 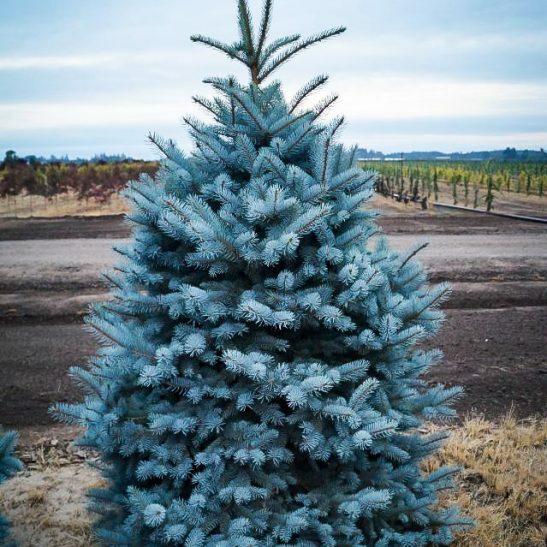 We regularly sell out of our unique evergreens, as we always stock the best forms, so to enjoy this great specimen plant, order now or you will be disappointed later.